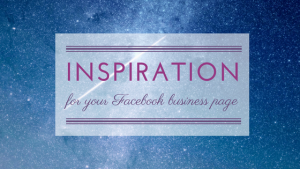 As a business owner, you may have been recommended to create a Facebook page. You go into it with all guns blazing, and then business tasks get in the way, and you may not feel quite as inspired as you were at the beginning. As a customer, coming to a page which hasn’t been updated for a few months feels like the business may no longer be trading, or that it is sporadic. This is not what you want to make people feel! So, if you are feeling uninspired, or just unsure of what to post, we wanted to create some ideas for you, that may be a little “out of the box”. Create images with quotes which inspire or motivate you (we highly recommend Canva). Pictures say a thousand words, and ones with quotes in them say even more. You can then share why this quote is one you feel inspired by, and why you chose to share it. Bonus idea – share a question to ask for others to share their favourite quotes in their comments – this will build engagement and may give you some new quotes to use in future posts! Share your week ahead. This is a really easy way to showcase what you do in your business, without sharing a sales post. Consider sharing events you are attending, people you are working with, or tasks you are carrying out in preparation for services you provide. This is an excellent idea for those of us who provide services and find it difficult to showcase how we help others. Share a testimonial or case study. These work really well in images as well, so you can input some recent kind words from a client in an image, and then share in the post how you helped the person who shared those thoughts. Recommend other businesses. This can be an excellent way to build relationships with your collaborative partners. You can share why you use them, how they help your clients, or simply just to boost a contact’s business page. Remember to link to their page by @ mentioning them. Share blogs and videos from others. This can be of blogs you have read recently, videos you recommend watching, or ones that are in relation to the services you provide. TEDtalks are excellent for coaches, for example! As a bonus idea, you can use your Facebook page to share your personal and business life – images and posts that show what you are getting up to tend to get the highest reach and engagement, and you can do these direct from your mobile device, so you can instantly share an image of you walking the dog, or getting a coffee from your local coffee shop before a meeting with a client. We hope you have found these ideas a boost to help you get started in creating posts for your business page on Facebook, we’d love to hear some ways you are using your Facebook page in the comments below, and if you have any questions at all, do share them too!